Elan Bearnais Pau-Lacq-Orthez (ProA) re-signed experienced 34-year old French international center Alain Koffi (207-83, agency: BeoBasket). He has a double citizenship as he also holds Ivorian passport. Koffi has played there for the last two seasons. In 34 ProA games he averaged 10.4ppg, 5.1rpg and 1.1apg last season. 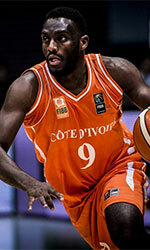 It was a very successful year in his career as he was selected to French ProA All-Star Game. Among other achievements Koffi's team won French Leaders Cup in 2014. He received also Eurobasket.com French ProA All-Domestic Players Team award back in 2015. Koffi represented France at the World Championships in Turkey eight years ago. His stats at that event were 6 games: 8.5ppg, 4.3rpg, FGP: 57.1%, FT: 76.0%. 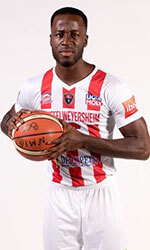 Koffi has played previously professionally also in Spain (Joventut) and France (Le Mans and SPO Rouen). It may be one of last seasons in his extensive career, which he may end at Pau-Lacq-Orthez. Koffi's game is described as: Has great athleticism and potential, runs the court well and rebounds very well; at only 6-8 he plays bigger than his size, but his future is at one of the forward spots, and he needs to add shooting and playing experience;.